Are you a Press Pass Member? Bring your card into Routes to Receive 20% off any half-day or full-day bike or snowshoe rental or tour. 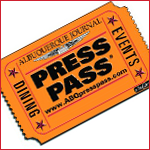 All ABQ Journal Press Pass cardholders get 20% off our rental and tour services!